Melissa Marshall aims to teach great communication skills to scientists and engineers, so that they can effectively share their work. 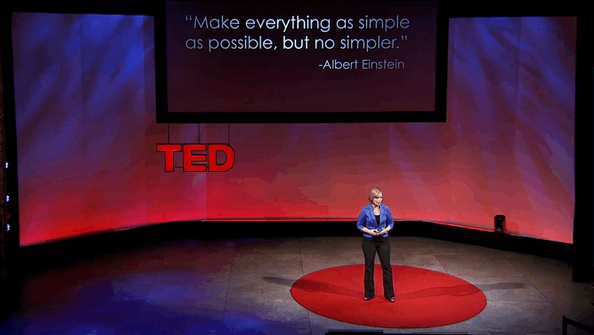 As part of her mission for effective communication Marshall gave an outstanding and engaging TED Talk that highlights a concept which most of us can relate to: fear of the unknown; the jargon, technical terms and unfamiliar words of the “techno nerd”. Marshall was talking about her experience in teaching engineering students at Penn State University, no not IT, but the concept is exactly the same. Initially she found that she was “scared of these students with their big brains and their big books and their big, unfamiliar words.” But as she had conversations with the students, she was amazed at their ideas and their knowledge and wanted others to share them. “So your science is relevant to us, so what?” she asks. As an example she introduces the biological concept of trabeculae: “You study trabeculae, don’t just tell me this is what you study, tell me you study trabeculae, which is the mesh-like structure of our bones because it’s important to understanding and treating osteoporosis.” Now we are interested. Avoid jargon. We all use it, every industry has it but it can be daunting. Marshall’s example, “Sure, you can say “spatial and temporal,” but why not just say “space and time,” is a perfect example of simplifying your jargon and making your words more accessible. We are mainly visual beings, pictures do paint a thousand words, and so a few words along with images will have much more impact. Presentations done well are informative and entertaining, badly done and they are boring. Marshall urges limiting bullet points; bullet points kill and they will kill a presentation, as it is too much reading, too much concentration is required and then the audience isn’t listening to the presentation. 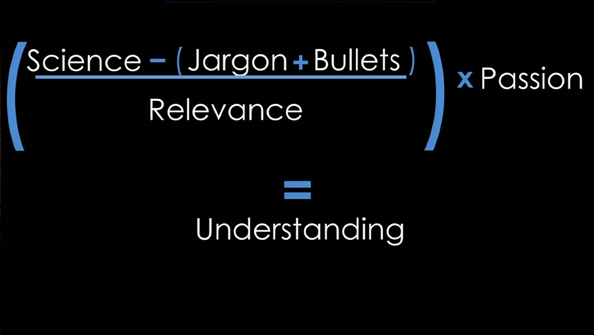 Take your science, subtract your bullet points and jargon, divide by relevance and multiply it by the passion for what you’re doing, and it will equal incredible interactions that are full of understanding. So when you’ve solved this equation, by all means, talk nerdy to me. Melissa’s great presentation can be found here.